Delete after playing: Is Snapchat getting into gaming? While Instagram dives deeper down the rabbit hole of longform video, it seems like Snapchat is going to take a slightly different route by dabbling in video games. According to new sources from inside the company, Snapchat is developing a full-on gaming platform which it plans to unveil later this year. The sources claim that at least one prominent publisher has already been brought on board and they’re bringing a game with them. Unlike the company’s previous experiment with game-like features, sources tell The Information that these games will be downloadable tiles from inside an app store on Snapchat. This likely has something to do with Snapchat’s acquisition of PlayCanvas last month and, according to those sources, plans are likely to materialize by September or October of this year. While the idea sounds far-fetched, Snap has introduced developer kits and began distributing them to developers around two weeks ago - and don’t forget about Snappables, the Snapchat Spectacles-based games already available in the app. 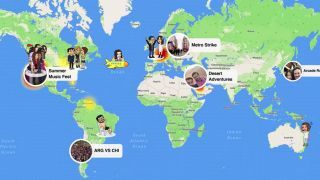 This next set of games will be different from everything Snapchat has tried in the past and more like the Facebook games that grew the company's business back in 2009 and 2010. The hope is that games will appeal to Snapchat's younger audience and, if micro-transactions are involved, add a new revenue stream. Does that mean your next match of Overwatch will be played in Snapchat? Probably not. But who knows, Farmville 3 might be.